Long ago, before the geeks inherited the Earth, before “Big Bang Theory” ruled the airwaves and superhero movies ruled at the box office, before everyone and his brother had a Dr Who t-shirt, “nerd” was not a label we wore with comfort, let alone bragged about. Being a nerd meant being ostracized, teased and bullied. Back then, your love for science fiction or comic books was something you kept to yourself, until, through some secret signal or other, you connected with a fellow traveler, thereafter to spend your lunches in the school cafeteria together, gleefully — if quietly — comparing notes on favorite Bradbury or Asimov stories, debating whether the Flash could outrun Quicksilver, or trying to figure out the science (if any) behind warp speed and photon torpedoes. Under the makeup and ears was Leonard Nimoy, an actor of considerable intellect and ability who worked hard to preserve his character’s dignity and saw it pay off as he and Spock grew into cultural icons. Fifty years later, with Star Trek such an integral part of popular culture, it’s easy to forget what a hugely courageous act it was to put on those ears for the first time. Like any actor, Mr. Nimoy must have wanted to be respected for his work, and to get more work, but both respect and future employment were on the line if the gamble failed, if no one would see beyond that odd makeup to the soul of the character. Today even Academy Award winners line up to shave their heads, paint their faces and apply fake noses, brows, ears and hair for superhero and science fiction films, but Nimoy took up the challenge in an age where most celluloid science fiction involved zippered, rubber monster suits, giant insects and wobbly flying saucers. 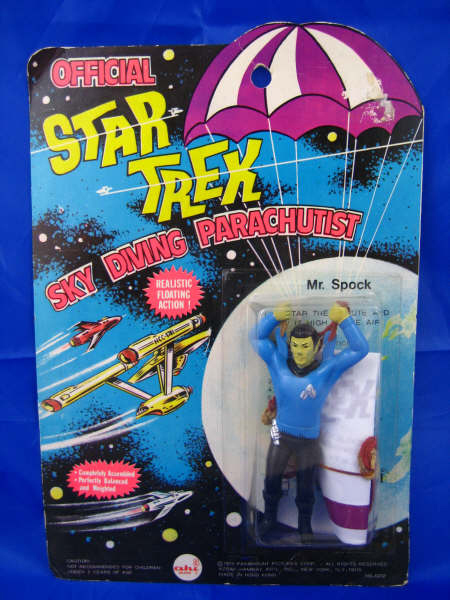 There were no guarantees he’d come out on the other end of Star Trek with any kind of career at all. It was to his great credit that he saw the potential in the character and was willing to put so much on the line to bring it to life. Everyone making millions today off of nerd-friendly movies and TV owes him a Vulcan salute. Of course, there was a lot more to Nimoy than Spock. He was a talented poet and photographer and directed non-Trek films like Three Men and A Baby and The Good Mother, for starters. But it’s a testament to the talent and sincerity he poured into Star Trek that, for once, it doesn’t seem disrespectful to link a real person to a fictional character. For many, thanks to Nimoy, Spock was as real as anyone they knew. Which, on the downside, kind of makes this a double loss. The last reel of Wrath of Khan, still and probably always the best of the Trek films, is filled with three-hanky moments as Spock sacrifices himself for the ship, says goodbye to his best friend and is given a “burial in space,” but the moment that always hits me hardest is when McCoy calls up to Kirk, still on the bridge, and tells him he’d better come running. Until now, Kirk has been so wrapped up in his battle with Khan that he hasn’t even noticed Spock’s left the bridge, but as soon as he hears that cryptic plea from McCoy, he knows what’s happened. He looks over to the science station to see Spock’s empty chair and the truth hits him like a punch to the gut. That image of the empty chair is more powerful in its understatement than all the gory makeup or teary dialog that follows. Today the chair is empty again, but unlike in the movies, and with due respect to Mr. Nimoy’s nominal successor in the role, that’s the way it’s going to stay. Rest in peace, Mr Nimoy, and godspeed on your new voyage. No, seriously. Might as well lock down Youtube now and call it quits. In this video, we finally understand the secret behind William Shatner’s…erm…unique speech patterns. Obviously he hears music the rest of us aren’t privy to. Watch as The Shat reveals Captain Kirk’s true love. Having proven himself too much man for any woman, Kirk unleashes his manly charms on a mountain. That’s right, a mountain.